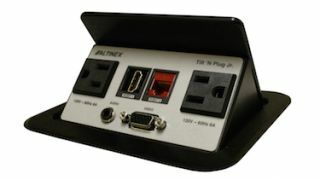 Altinex is the first company in the AV market to receive the UL listing for installation in kitchens, bathrooms, and countertops of numerous models in its TNP Series of tabletop interconnect boxes, according to the company. With this new designation, numerous models within the TNP product line—from small, single-line, AC-equipped models through the company’s largest units—can now be safely installed into custom kitchen counters, bars, or any other location where water is typically splashed. The result is greater installation flexibility for AV integrators and enhanced safety for end users that is backed by UL’s rigorous safety standards. Those models within the Altinex TNP Series product line that now have the new UL listing include small, single-AC-line TNP units such as the TNP120, TNP121/121S, TNP125/125S, and TNP128/128S. Dual-AC-line TNP models with this new designation include the TNP150C, TNP151/151S, and TNP155/155S. Large TNP models with this listing include the TNP328/328S, and the company’s largest models with this designation include the TNP528/528S and the TNP530.